Collegium Singers enters its 25th year as a chamber choir singing a work which has long been associated with much larger choral forces. 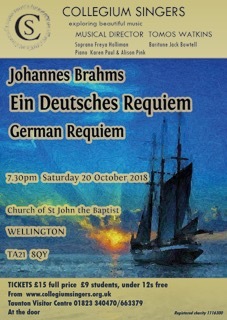 Ein Deutsches Requiem is most often performed with full orchestra, however at the request of his publisher, Brahms created a version of the score to be made available for chamber performance with piano accompaniment (four hands one piano). This version of the work travelled to England for its British debut at a private residence in London, presented in English and without the Fifth Movement. Brahms himself conducted around 30 singers and two pianists at that event. The English translation used then has been lost, so we shall be singing the original German texts drawn from verses of the Lutheran Bible. The choir will be led by Tomos Watkins who has recently graduated with distinction from his postgraduate conductors’ programme and will be joined by two talented young opera students, Freya Holliman and Jack Bowtell, from Cardiff to perform the Soprano and Baritone solos. The pianists will be our well-known local musicians, Alison Pink and Karen Paul. The choir will also sing the Stabat Mater by Giuseppe Verdi.